Short A is usually the first phonics sound you teach in kindergarten and first grade so I figured it'd be a great sound to show you teaching ideas and resources for! This is a long post but it's filled with pictures and I promise if you read through it, you'll find great ideas and some awesome FREE stuff along the way too! So the first thing I want to talk about are these pocket chart cards. I LOVE them because they can be used for so many different things! There are 39 different cards for short a alone so it's lots of practice! My favorite thing is to use them as a pocket chart center. 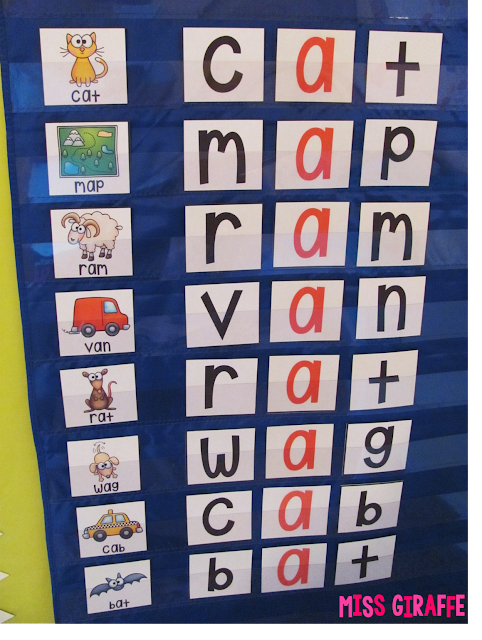 Put them in a pocket chart and have students build the words with the letter cards that are also included in the pack. Can we just talk about my pocket chart for a second though?? I'm sort of obsessed with my monster pocket chart center. 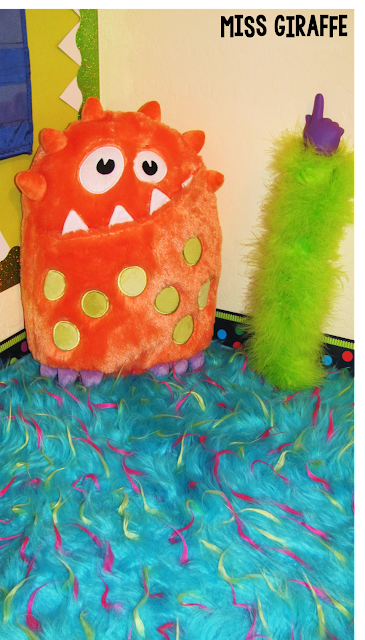 I found this fun furry monster rug that's teal with lime and hot pink furry strands that stick out. Then I also fell in love with this little stuffed monster guy who's mouth is actually a front pocket so it's perfect for keeping the teaching pointer in but I wanted to show you that too. I wrapped a finger pointer in a green boa to make a monster arm for pointing to the pocket chart with! 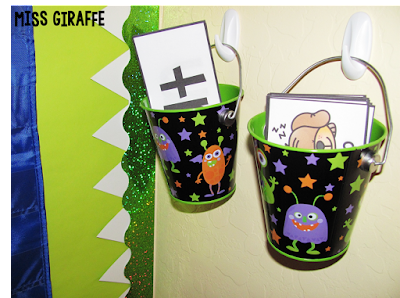 Then I found these cute little monster buckets for only a dollar each that I put the pocket chart center materials in! There are a ton of them and you can do SO MUCH with them! 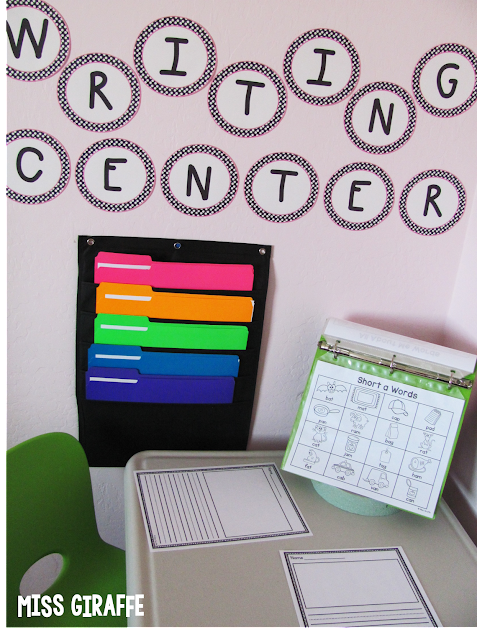 You can use the sorting headers that come with the cards to make this a great sorting pocket chart center where they sort the picture cards by word family. 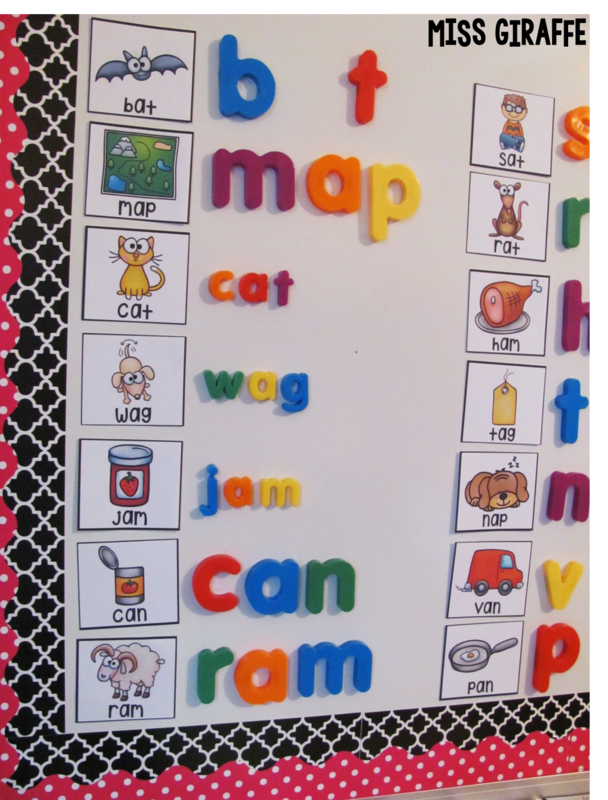 Let them pick out cards and build the words with magnet letters on the whiteboard. 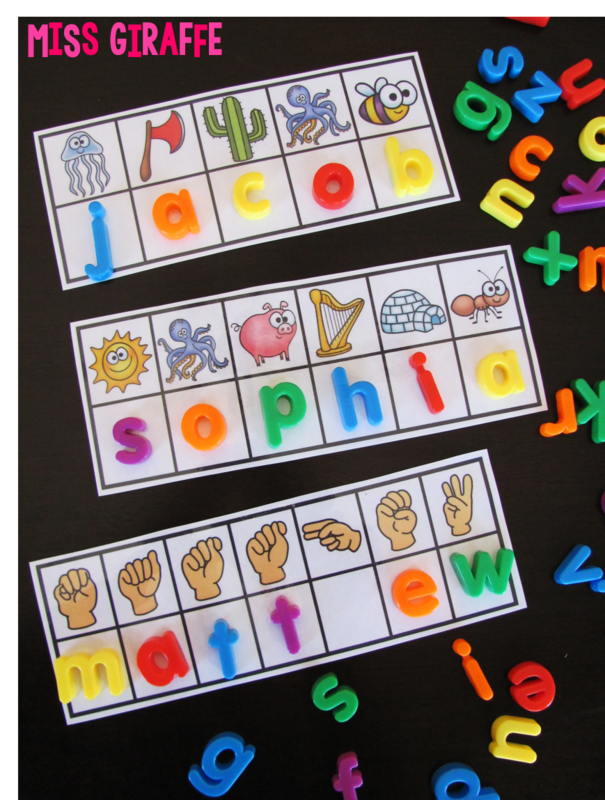 If you'd rather students stay at their seats during centers, you can also easily use a magnetic cookie sheet from the dollar store that are perfectly lap sized for students to put the cards on and build with magnet letters in their lap. You can also just let students take the cards and a blank sheet of copy paper and STAMP them. Stamps are always an engaging activity! I LOVE these alphabet stamps because the letters are perfectly primary. 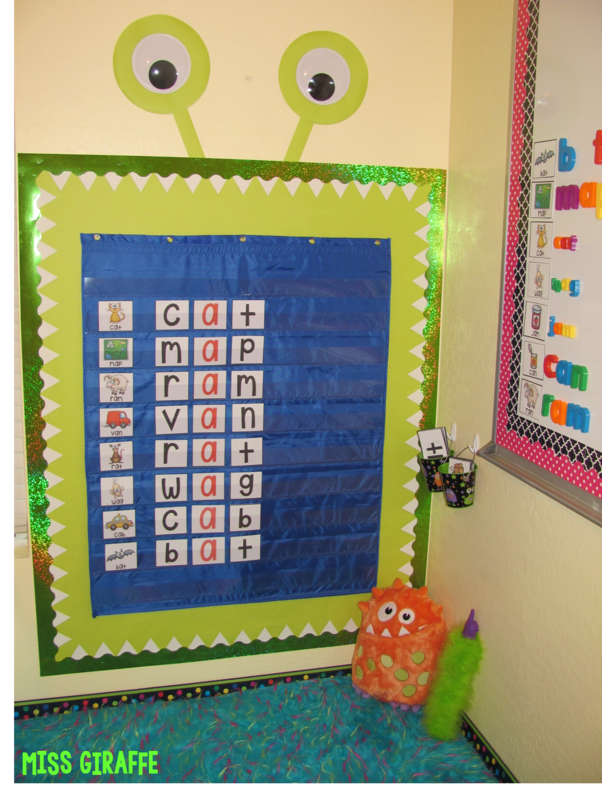 You can also put them around the room and have students find them and write them on a piece of paper. I call that activity "Find and Write" - super easy. Use that tack putty stuff to hang them on walls- it doesn't leave a mark and goes on/comes off easy and you can peel it off and reuse it.. I love it! So all you do is put the cards around the room, tell kids how many there are, have them grab a piece of paper and a clipboard, and have them search for them and hunt for them all. Fun, easy practice that gets them up and moving! I also LOVE sand writing!! You can get colored sand really cheap at craft stores. 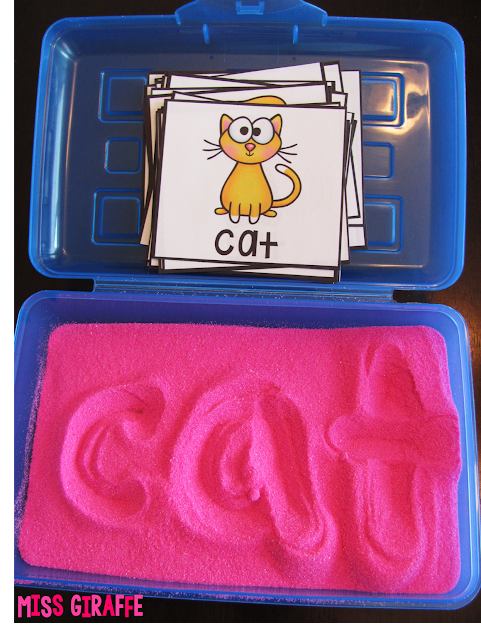 Fill a pencil box with it for easy storage and have students put a card at the top and trace the word in the sand while saying the sounds in the word. 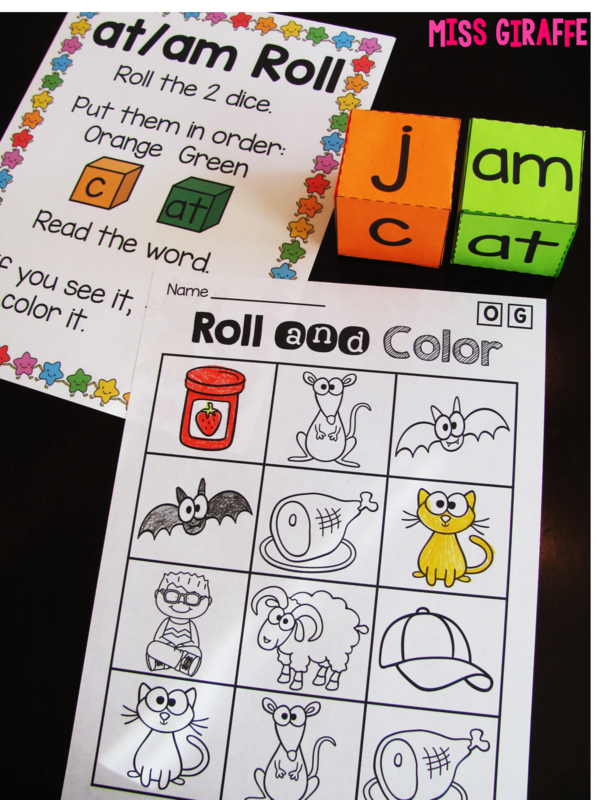 To make them a quick and easy matching center, snip the bottoms off and have them match the picture to the words as a little small group activity or literacy center. 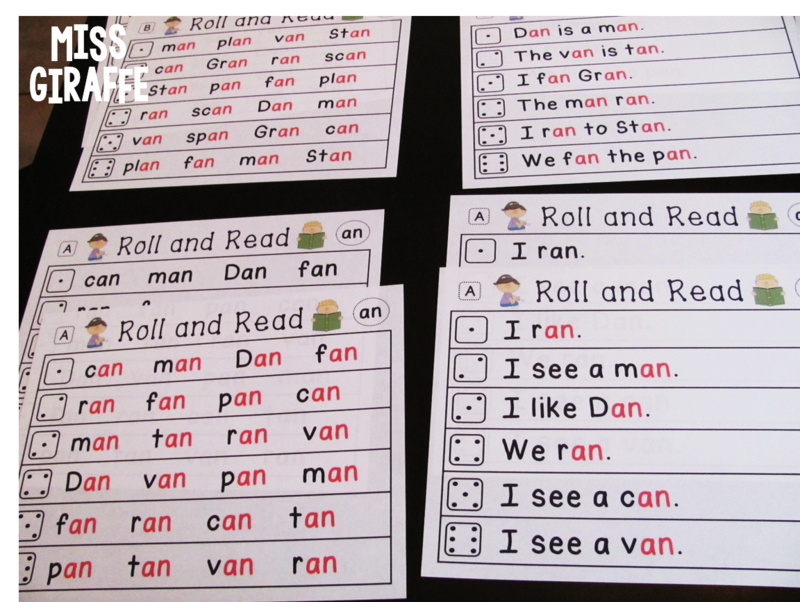 You can also laminate them and put them on a binder ring so students can grab it any time they need for help writing or spelling or just to practice reading the words. I like to put them on hooks so you can just grab the sound you want words for and take them to your seat or the writing center. Speaking of the writing center, here's my little writing center! It's tiny and not too fancy but I like it. The "Writing Center" sign I just stole the letter headers from my black and white polka dots with pink trim word wall set - I have them in other styles/colors too but this is the pink & lime corner so I did pink :) - I like to take the letter headers from them to use to label stuff because I'm lazy and I like designing my own letters so they all match and aren't as huge as the ones you buy. ANYWAY! 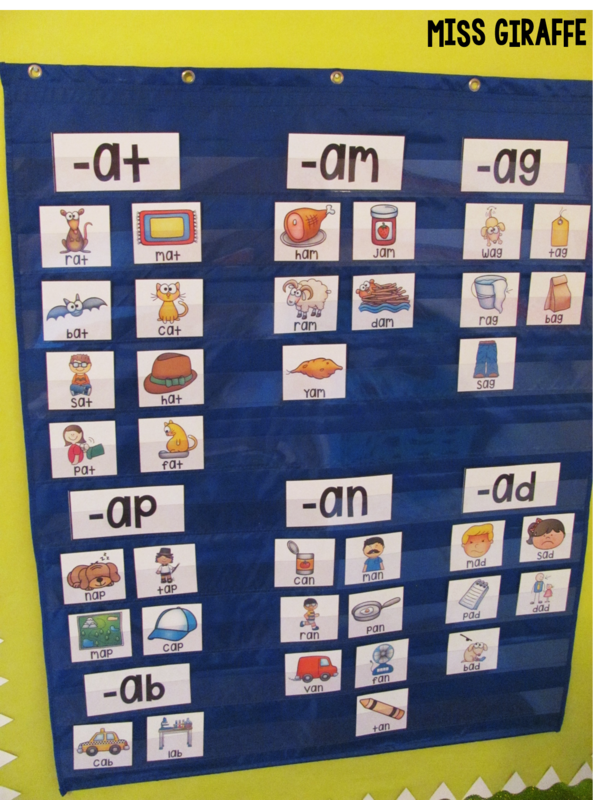 As you can see, there are writing materials and a Short A words chart for students to use for writing inspiration and for correct spelling of the short a words. The short a word chart is in my short A no prep pack - I have one for each phonics sound in the no prep pack it comes in. I just throw them all in an upside down binder in sheet protectors and flip to the sound that week. It's nice because kids can flip through if they want a different word that makes a different sound. 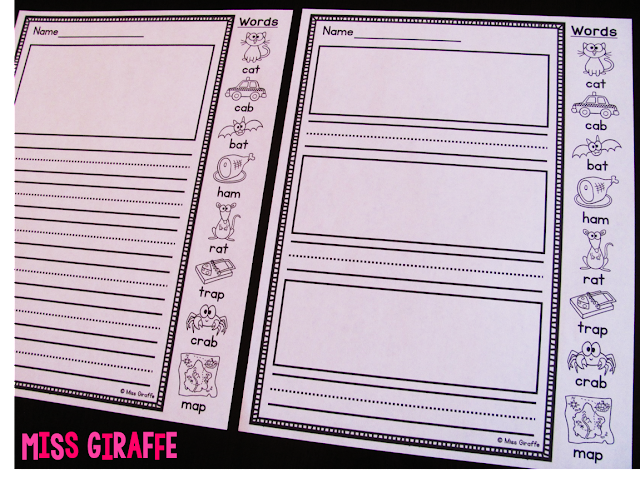 Since they're black and white, you can also print one for each kid to color themselves and keep in their writing folder for reference. I also throw my Themed Writing Charts in the binder for fun word choices by theme. They come in color & black/white too but I throw the color ones in there because I think the color helps spark the imagination :) They have fun themes like ocean words, bugs, farm animals, zoo animals, nature words, home and family words, foods, color words, etc.! Other fun sheets in the writing center are these writing helper sheets that have the short a words on the side. They're also included in my no prep packs or I have them in a year set with all the phonics sounds. 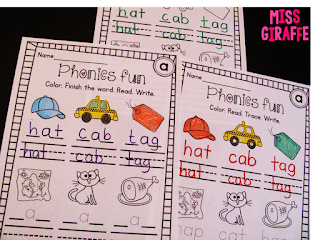 I recommend the Phonics No Prep Mega Bundle of all the phonics packs bundled instead but if you just want these writing sheets, they're in that year set I linked above. 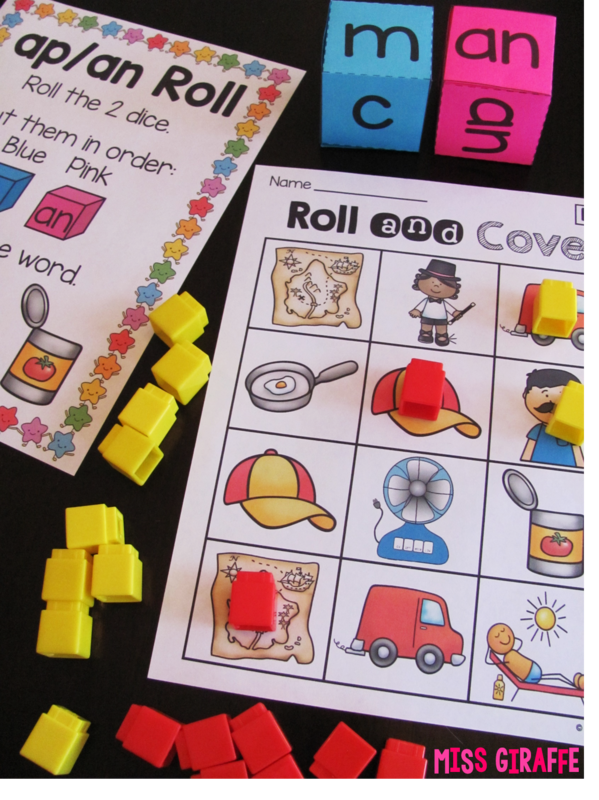 Please note that the phonics no prep mega bundle doesn't include the hands-on centers - if you want those, they're in the Short Vowels Ultimate Bundle! As you can see, there is the one drawing box and writing lines option to write a story using the short a words on the side OR a version that has 3 different boxes each with its own set of writing lines which is good for your lower students or just for individual sentence writing practice. There are TONS of other pages in my Short A Worksheets and Activities NO PREP pack as well - it has over 45 fun and differentiated worksheets and activities that are no prep - you can just print them and hand them to your students... which, let's be real, is such a plus. Teachers spend so much time prepping and anything you can just get and immediately use without any cutting/laminating/thinking is a dream come true. I have them for pretty much every phonics sound and the activities are consistent so once you explain them once, they can do them all year and all that changes is the phonics skill they focus on so students can spend all their cognitive energy on practicing that sound rather than how to do the activity. As I say in this blog over and over, differentiating for all students - both low students AND high students - is really important to me so I try to include the same activities in different levels as much as possible. 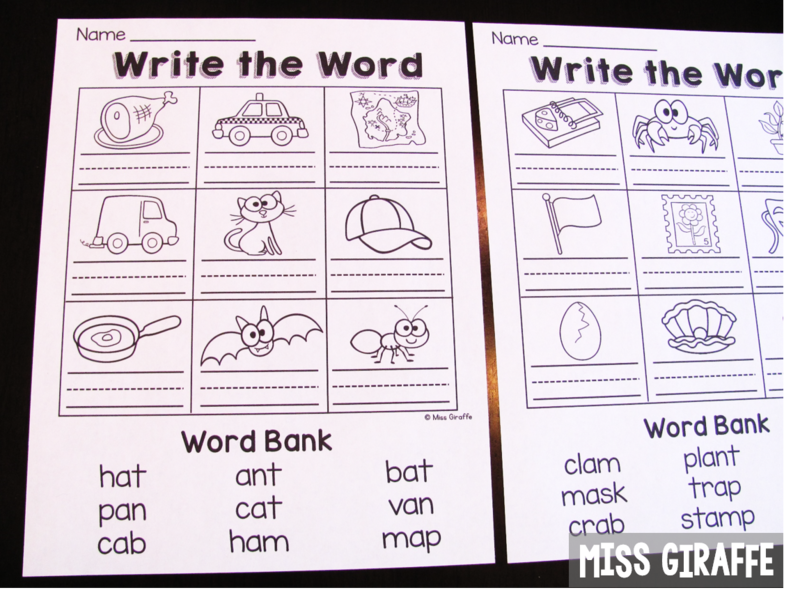 For example, for these "Write the Word" worksheets, you could give your on level kids the sheet on the left and your higher kids the sheet on the right. You could also start with the easier and move on to the harder one if/when your students are ready. Another example are these worksheets where your low kids do the sheet where they just have to trace the word and write it, your on level kids figure out the beginning sound then write the word, and your high kids have to figure out the beginning and ending sound to figure out the word. 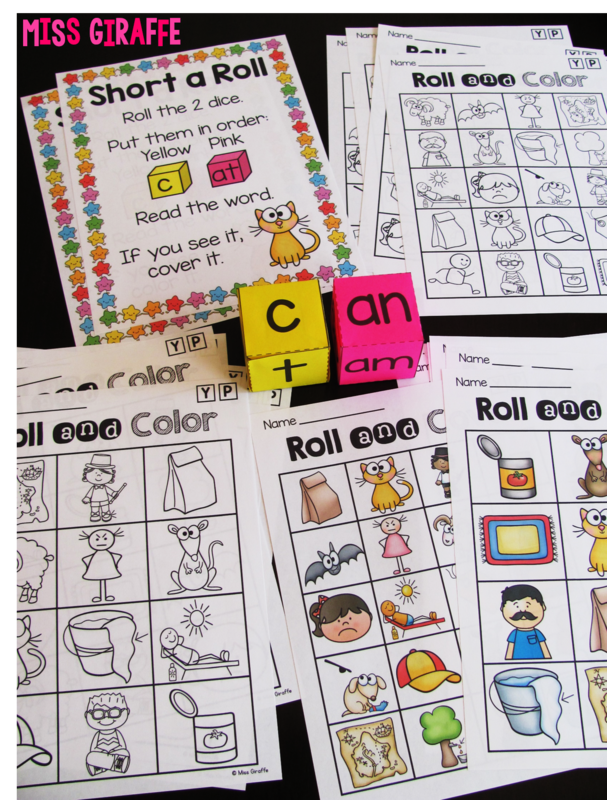 There are a lot of great worksheets to challenge your higher kids that are fun for everyone too! Students put a paperclip on the spinner, put their pencil in the middle, and flick it to land on the word family to add to the next letter. They write it and if it makes a real word, they circle it! Students start at the shaded box and read the short A words to go through the maze to figure out the sentence that matches the picture. It is SO FUN and one of my absolute favorites. Crossword puzzles are also one of my favorites! You may be thinking it's too difficult but students are motivated to figure it out so they do! They just look at the picture and find the word that it is and write it in the boxes! My Secret Word activity is also a popular one. You can get a few free ones for short a here. They're a little different than the one in the no prep pack (I used a different font for the letters they use). Students look at the pictures and build each word. 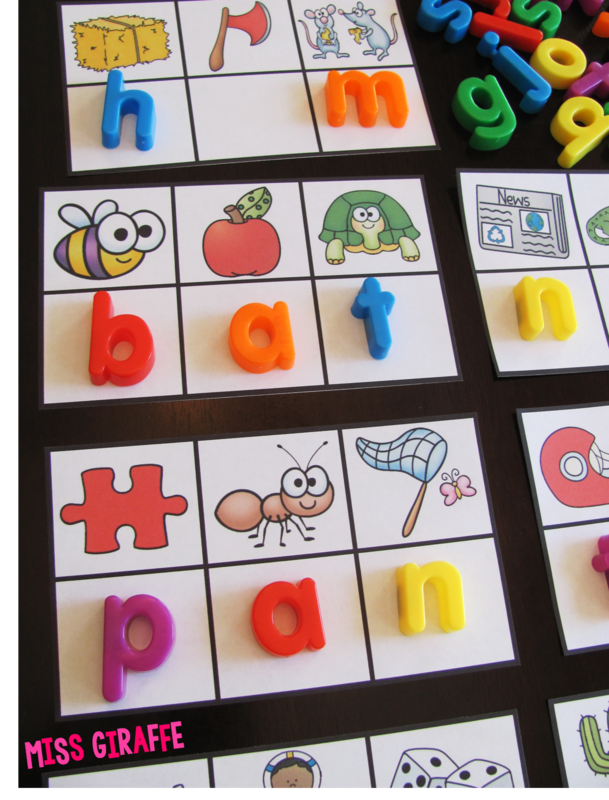 Then, for the 4th picture, they unscramble the letters they have leftover to figure out the secret word! Then, they build it and draw/color it. To differentiate for your struggling students, I recommend a lot of word family practice and pictures to aid their understanding. 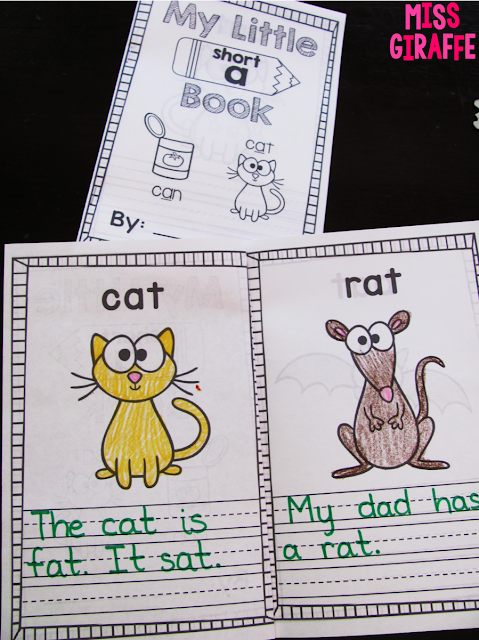 Start with JUST pictures first to help them hear the sounds in the words like -at in CAT. Each one of these focuses on only 2 word families at a time so it's not too overwhelming. Then there's one that practices all families together as a review. NEXT, practice simply finding those words in sentences. 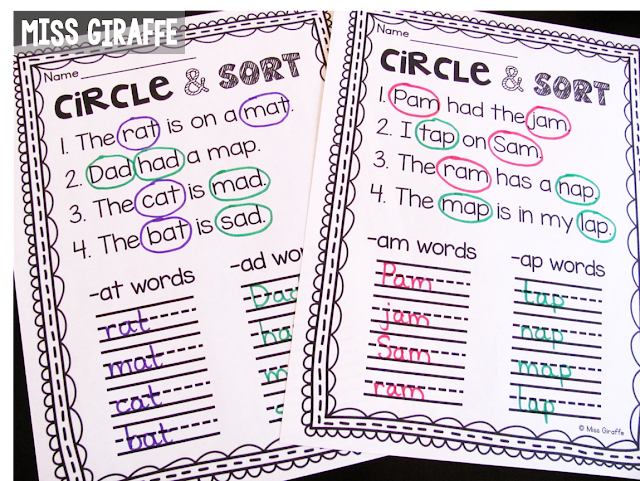 For circle and sort, they find the words in the sentences that belong in certain short a word families. These are great because even your non-readers are finding the words in context and sorting them. I recommend having them circle the words from each family in a different color using markers and writing them in that color at the bottom like I did. The color coding really helps them see it. After they circle and sort, they can try to read their sentences! Now that they are ready for sentences, I recommend practicing them at a very basic level. These are simple for your low students to feel successful writing their own sentences by first tracing it then rewriting it on the lines. The picture on the side will help them decode the sentence when they read it. It's a great confidence booster that practices both reading and writing short a words in real sentences which can be important for your reluctant readers and writers. As you can see, you can step-by-step get them there! They may take longer but every student CAN do it. That is something I have always firmly believed. Like I said, you can grab all these pages in my Short A Worksheets & Activities NO PREP Pack! One of my favorite centers is SECRET CVC Words! 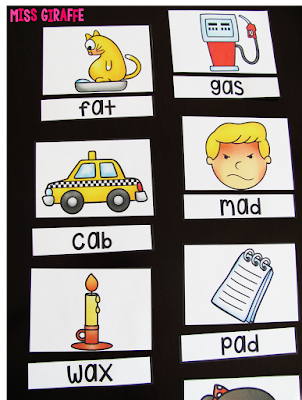 People told me how much they loved the sight words ones so I made them for various phonics sounds like CVC words, CVCe words, beginning blends, vowel teams, etc. and these are the CVC ones! I LOVE them because kids get to be word detectives while also practicing reading CVC words AND practicing their beginning sounds. Students look at the picture to figure out its beginning sound and put their letter magnet underneath it. They do this for each picture until they spell the secret CVC word. I actually love using bottle caps that I write letters on with a permanent marker because it's cheap, easy, and I don't care if letters get lost. 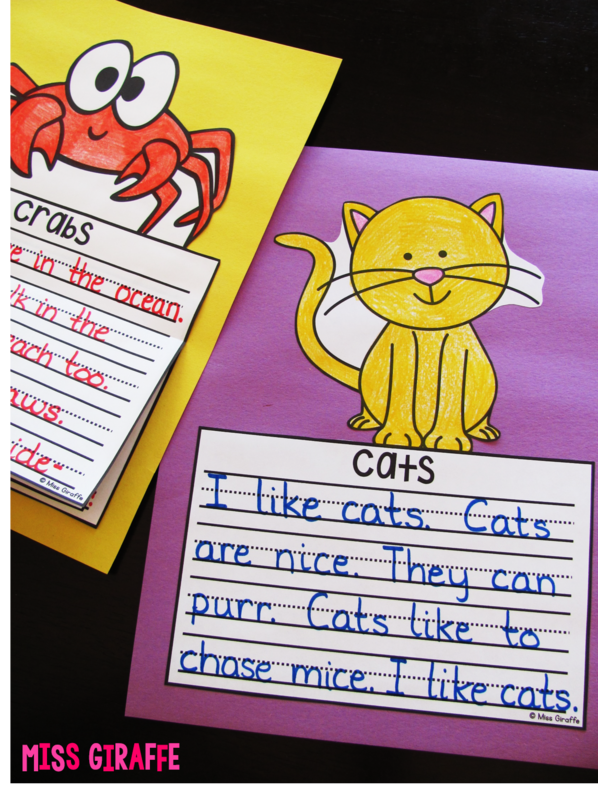 You can also laminate them and write on them with dry erase markers! 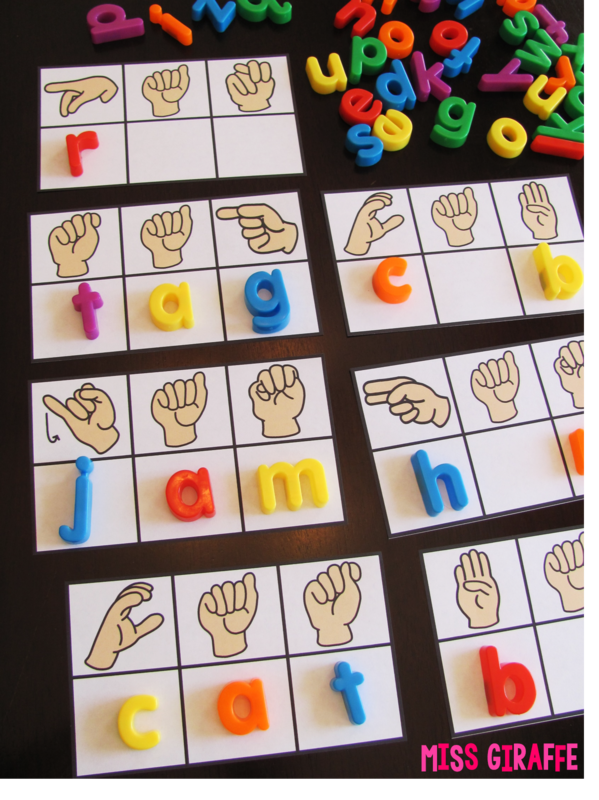 For an extra challenge, I also make a sign language version of this center! This is great for your students who need an extra challenge because they're practicing their words and technically learning a new language... your high kids will eat. this. up. Speaking of names, I actually make these cards CUSTOM for the kids' names in your class too in case you didn't know! I LOVE making them and seeing all of the unique names around the country/world. You can order your class list's names here if you want them. After you order, you just send me a list of your kids' first names (up to 30). Any time you get a new student, just send me an email and I'll add it for you if you haven't used up your 30 names. You also get access to ALL of the names - I add all of the names teachers have ordered to the file alphabetized and hyperlinked so you can easily see if any of your students' names are already included to use less of your 30. You have up to a year from date of purchase to use all your names but you can always re-download the file to see what new names have been added... there are a TON of names in there already and I've been adding more like crazy as teachers send me their lists! A great FREE center for your lower and ELL students are my free Short A clip cards! Kids simply read the word in the middle and put a clothespin on the picture that matches the word. Easy practice! 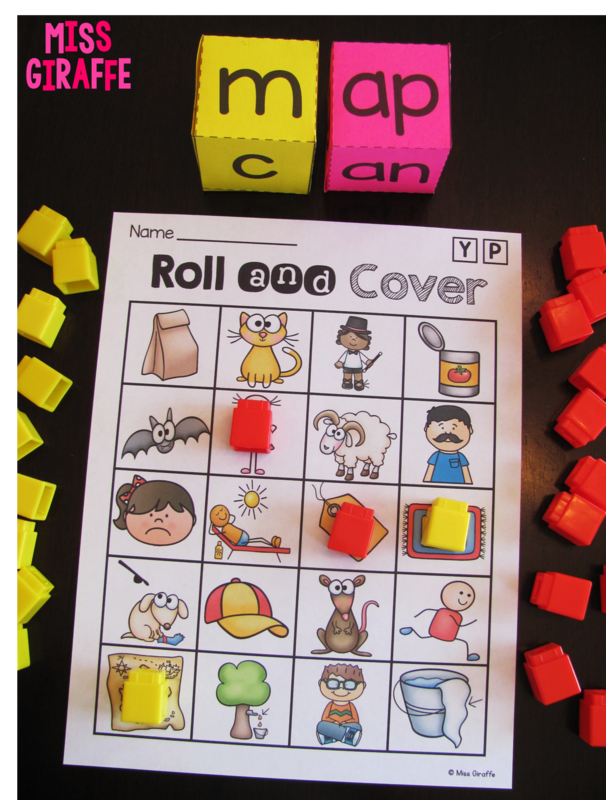 Another center great for your lower students is this word/picture match pocket chart center. 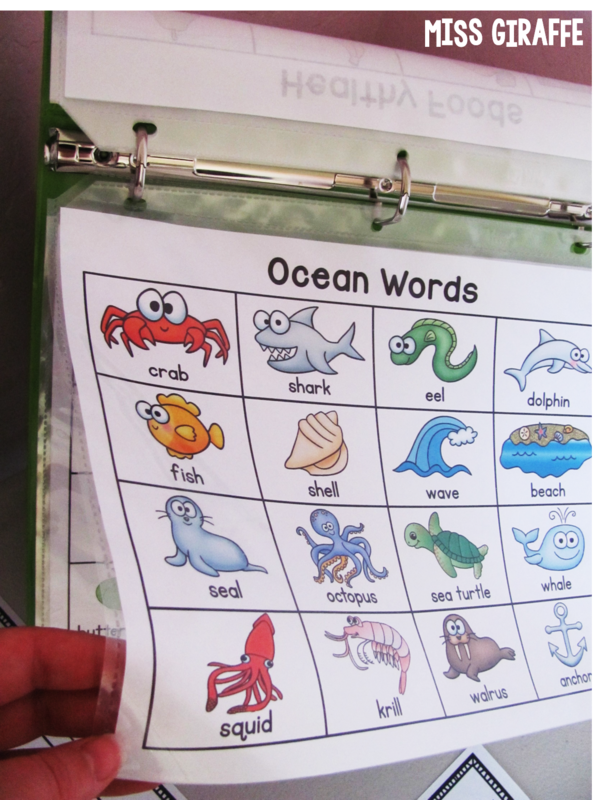 It's super simple - kids just match the word to the picture on the pocket chart and record on their recording sheet. This pack has all the sounds for the year in it but only SIX words per sound / recording sheet so it's a great center that won't overwhelm your lower kiddos. Okay, okay, so I'm SO super excited to debut this one! 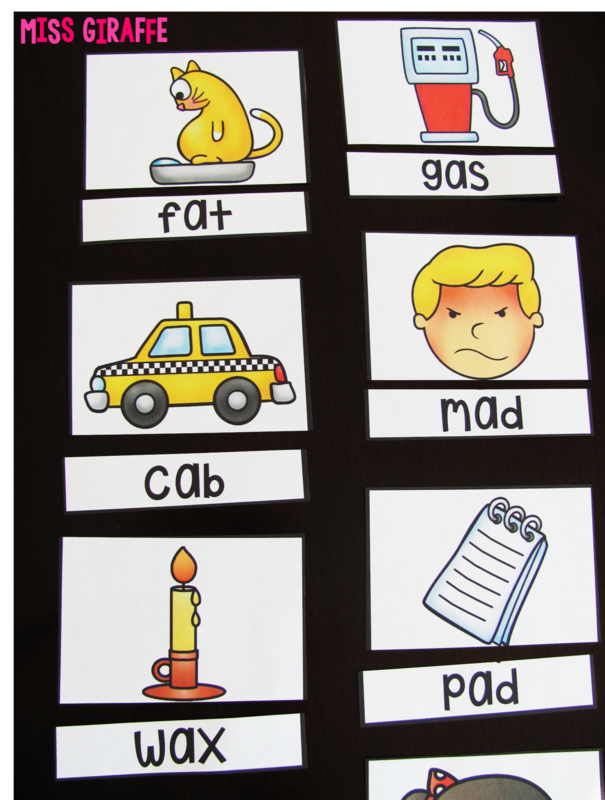 SO, I decided to make ones that focus on each short vowel so you awesome kindergarten teachers can use them right away!! I not only made dice and differentiated mats that will produce words from all 6 popular short a word families (at, ap, am, an, ad, ag), I also differentiated it down again by making 3 other short a centers that each focus on only 2 word families at a time! I love these dice, too, because they produce a real short a word most of the time.. and when they don't, it's great nonsense word practice! I present to you.... Short A CVC Word Families Roll!! This is the activity for all the short a word families where they roll the 2 dice (the onset and rime) to build their word! If that word is on their mat, they cover it! Cubes work great but any type of marker will work! They always put the dice in the same color order - and there is a directions sheet for each center if they forget! For the "Short A Roll" that practices all 6 short a word families, I made 5 mats in the 4 x 5 grid for (20 pictures total) AND 5 mats in the easier 3 x 4 grid (12 pictures total) so students can each have their own sheet to play in groups, partners, etc. It's a great partner game or game to play in small groups! What I really love, though, are the ones that focus on 2 word families at a time to start out with. These are really targeted practice to get them working hard on those word families! Those centers each have 5 different mats in the 3 x 4 grid. Also, you can do the Roll and COVER version like I showed above or there's also Roll and COLOR where they are black and white versions of all the boards and kids take turns rolling the dice and coloring in the picture they rolled on their sheet. I LOVE this version as an easy print and use center. They will love playing again and again. and one that practices -ad & -ag only! 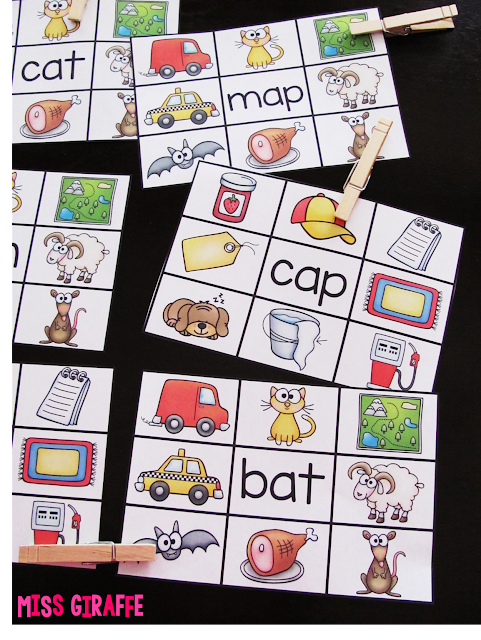 I made a set for each short vowel so they can keep playing it for the other vowels and then play the CVC Words Roll version with all the vowels mixed as an awesome review later! Another center that I love is the PUZZLES center!! Can you believe I made it so far down this blog post without mentioning puzzles?? I'm pretty sure almost every concept I've blogged about has puzzles! So one puzzle idea I like as an easy activity for fast finishers is flipping a real puzzle upside down and writing the words on the back! 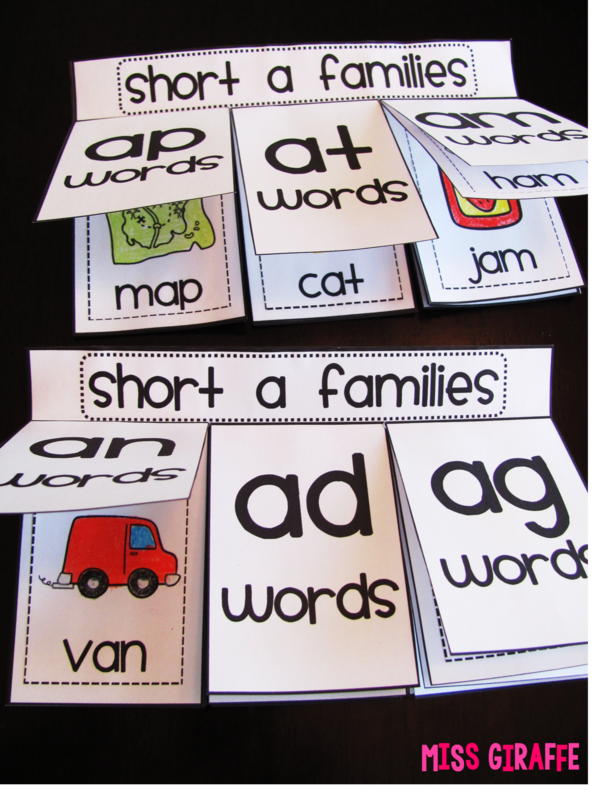 Grab 3 pieces that fit together and write a short a CVC word on them. Do it for as many words as you want them to do (the more you do, the more challenging the activity). 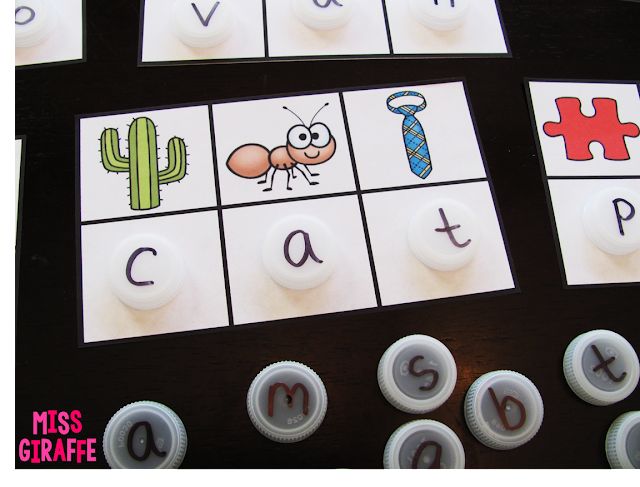 I recommend making a baggie level A (6 words), baggie level B (15 words), and baggie level C (30 words)... this will keep them SO BUSY putting the words together, it's amazing. Make sure you skip at least 1 piece all around the ones you pick as 3 that go together so they only will match up with the letters they go with to spell each word. I took a 1,000 piece puzzle and made a ton of these for different words! You may remember I also made numbers 1-100 puzzles in my number sense blog post that people really seemed to love so this is a lot like that :) Just get a puzzle at the dollar store, flip it over, and voila! 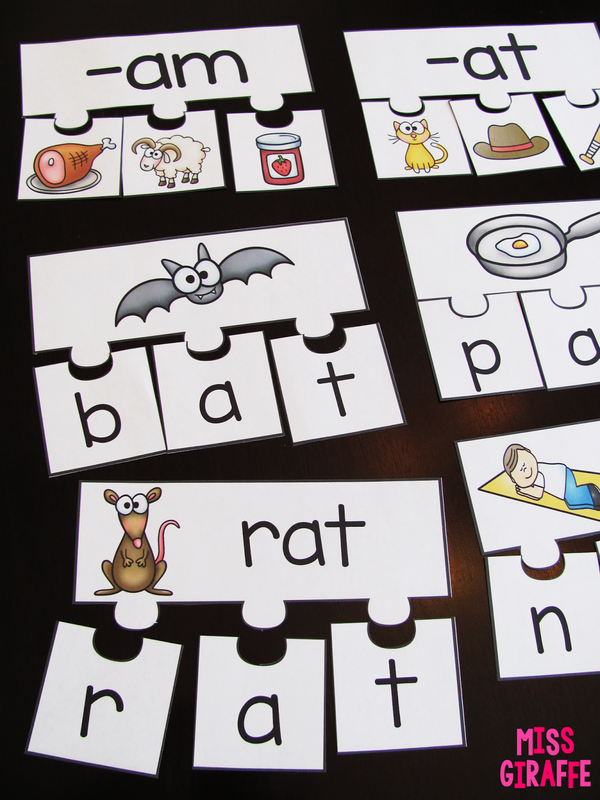 I also have ready to go puzzles I made for practicing the CVC words with picture help that are a lot of fun. These are the Short A CVC Puzzles! 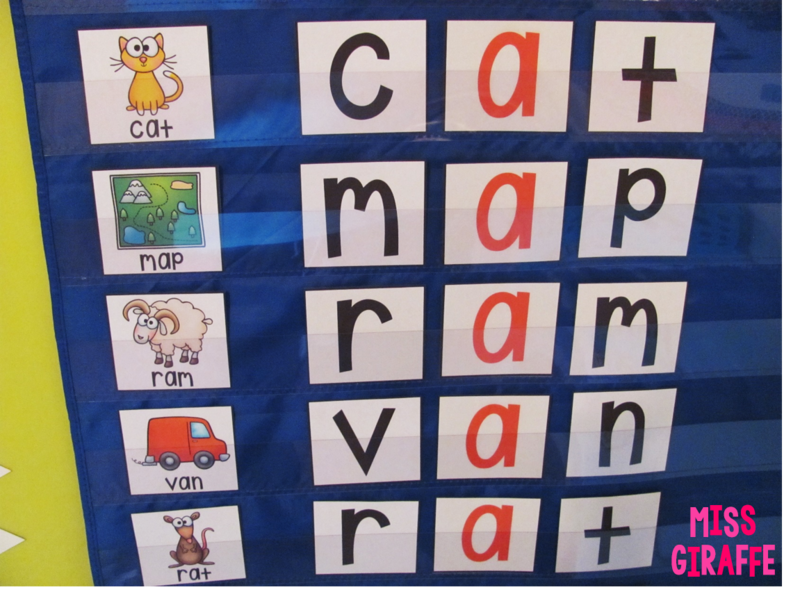 They're an easy way to get your students building CVC words in a hands on way and allowing for differentiation. 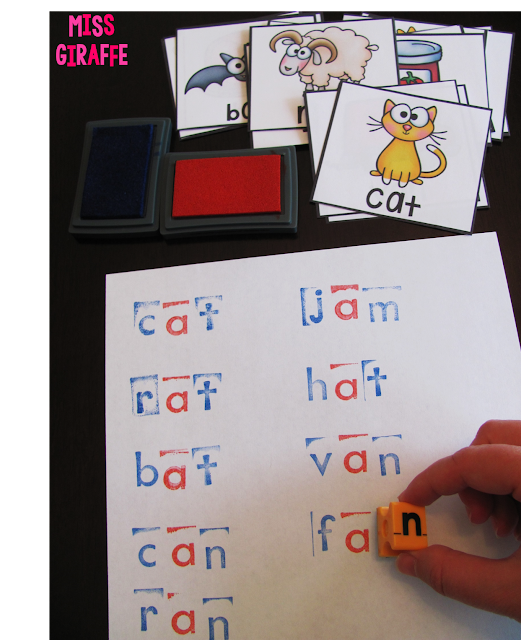 For more challenging puzzles, I LOVE using these Short Vowels Reading Fluency and Sequencing Puzzles! Students read the fluency passage and then sequence the events of the story at the bottom. Simple, right? 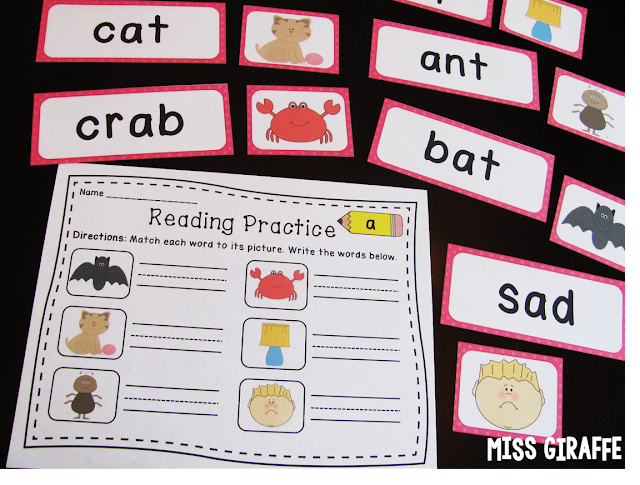 It's awesome targeted phonics practice, fluency practice, and sequencing practice.... and it looks like a game! Each word family comes with 2 levels of words also in 2 levels: with helper red text and without... and 2 levels of sentences also in 2 levels: with helper red text and without... so essentially there are 8 levels for each word family. Wednesday: Repeat Monday (words with red then black only words) but with the Level B sheets. For your high group(s), start the Level Bs on Monday. Thursday: Repeat Tuesday (words with red then sentences with red) but with the Level B sheets. 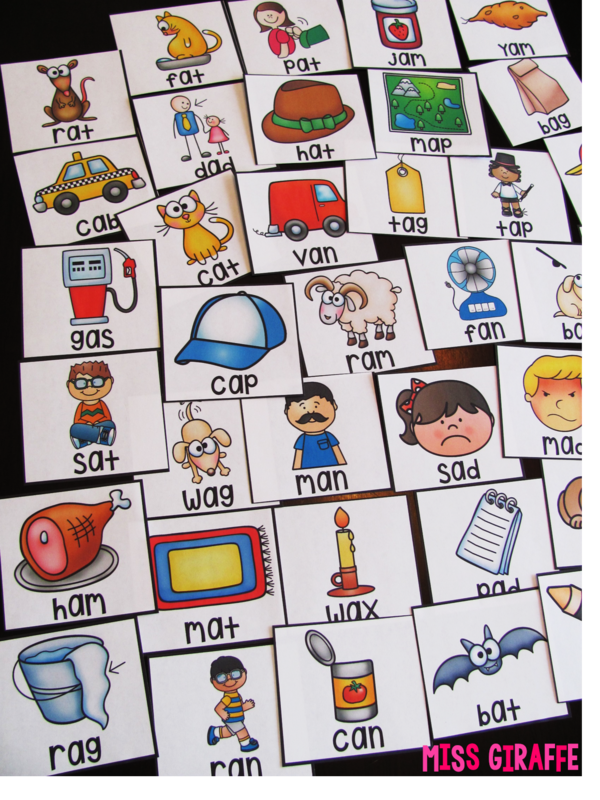 Friday: Black words then black sentences in whichever level you think they can handle! You could do the As then the Bs. 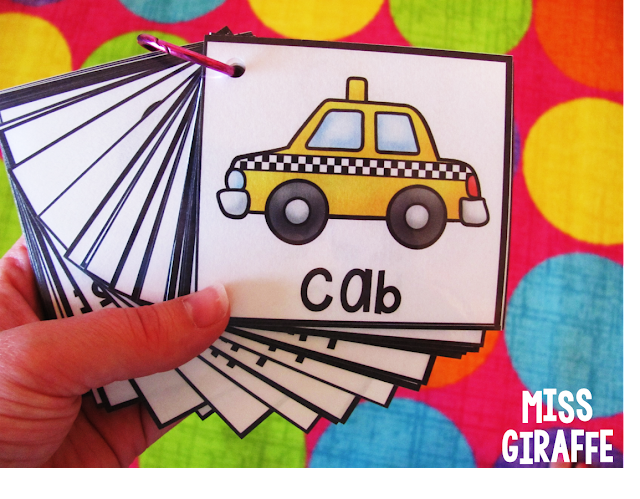 These are great to throw in as a center as well for lots of reading practice! 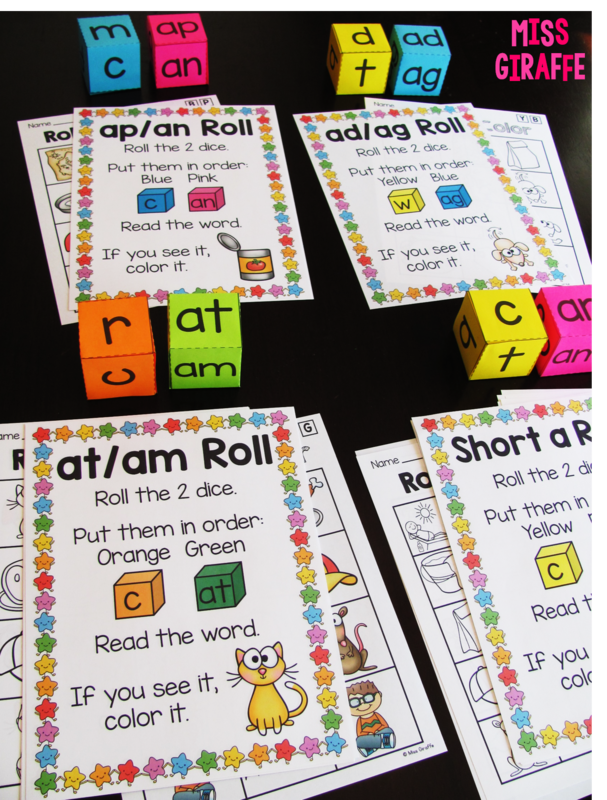 That set includes the leveled roll and read activities you see above for the following word families: am, at, ap, ag, an, ad, ack, ig, in, im, id, ip, it, ill, ick, en, ed, et, ell, est, ent, ot, op, og, ob, ock, ug, ub, uck, and unk. 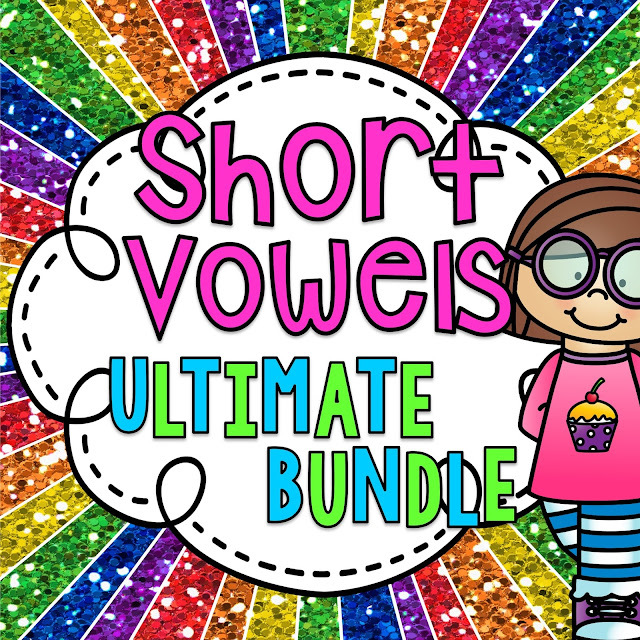 I also have more packs of them in my store for long vowels and other phonics sounds if you want even more - I actually sell them all in a big bundle here that has over 1,000 pages. You want targeted phonics practice where everything they're reading is practicing that phonics skill - in this case: short A! I have little readers for phonics sounds that are in color and black/white that are great for small groups... you probably already have some from your reading curriculum and those are probably perfect! One of my short A readers that I wrote is The Fat Cat. On Monday, print the reader from your curriculum or my reader, and have students go through and underline, circle, or highlight all of the short A words they can find in it while "reading" it. They should be reading it but some might skim. Have them read it out loud in front of you as they mark the words. I think highlighting (with a light color like yellow) is best because it highlights the word without making it distracting by putting lines through it by accident. Once they have highlighted all the short a words, have them read through it again. It should be smoother this time! Allow them to take the books back to their seat to color and bring back to you when they're done (or when centers are over). On Tuesday, read the book they highlighted and colored together in a small group. Then, partner them up at the table and have them read it with their partner. Then, let them take the book home to read to their family! On Wednesday, bust out the fancy schmancy color version of the books to read again in small groups. Read the book together and focus on comprehension. Ask questions. Have them ask questions. THEN, the fun begins... dun dun dun! Bring out a little sand timer and tell them to put their finger on the first word. Say, "Ready... set... go!" and have them read the book as fast as they can. Holy moly will this build their reading stamina and they think it is the most fun thing in the entire world! Say "stop!" when the timer runs out and have them put a little tab (or strip of sticky note you rip off, whatever) on the word they left off on. THEN, say they're going to try to beat themselves. Yes, beat themselves. This is how you make it competitive and fun but not against each other. They're trying to better themselves - not compare themselves to their friends next to them. Plus, they should be touching each word they read so their eyes stay on their book and they obviously want to read fast so there's no time to look around :) Another solution to any reading insecurities is that if you finish before the sand timer runs out, you flip to the first page and keep going because oh-my-goodness-you-finished-it-and-are-even-doing-it-again that way there isn't a kid ever reading by themselves or start to hear the other voices fade. Trust me, just try this. On Thursday, it's time to start really reading sentences in a text and comprehending. Give students a fluency passage focusing on the word family you're working on. 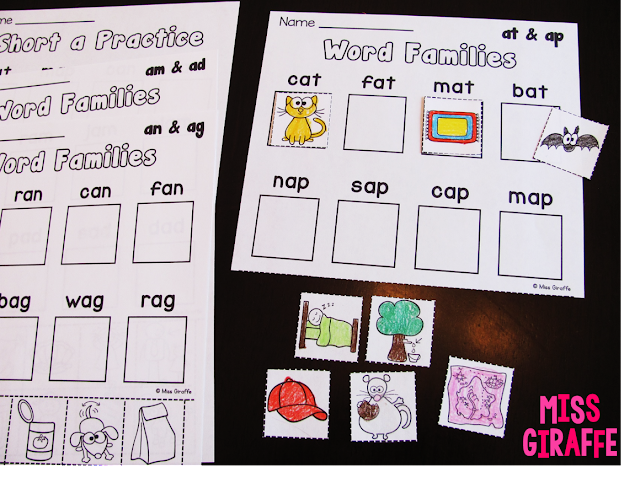 I have an entire set of Short Vowel Word Family Fluency and Comprehension Passages that covers all the short vowel word families where each passage focuses on a specific family. Each sheet has a reading passage that focuses on a specific family, a picture to aid comprehension (each also comes with a version without a picture for easily distracted students or for assessment), and 2 comprehension questions at the bottom. 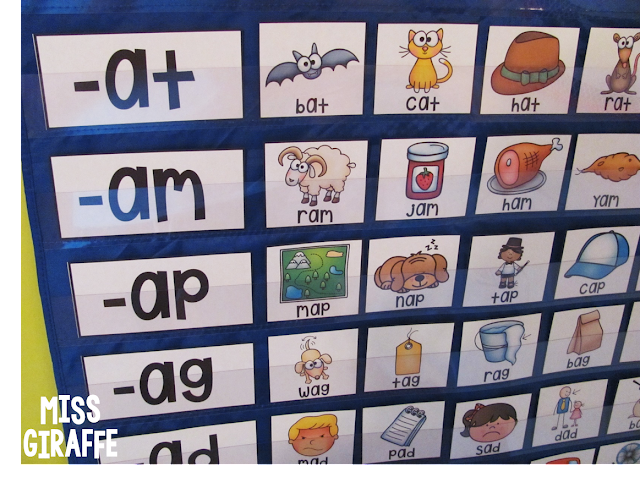 Have students highlight the short a words as they read it out loud. Once they've highlighted it, have them either read it out loud by themselves (or to their partner or as a group) then let them go to their seats to color their picture and bring it back to you when they're done. On Friday, read the passage together. Then, have them take turns reading it to their partner at the table. Next, go through the comprehension questions together. Read the question with them, have them think for a moment, and then talk about it with their partner. Once all the partners have agreed, have them share out to you and mark it. Then, it's sand timer time! :) Have them circle the word they ended on.. then do it again and underline that one.. then tell them to take it home to their parents and read it to them. Okay so it's Friday now. You're tired. You've sounded out cat 9,348,234 times and your kids realize that the weekend is a mere few hours a way and are getting antsy in their pants-ies. So what do you do?? Um, crafts and games obviously! But where you learn stuff. :) Can you tell by my writing skills deteriorating toward the end of this post that I feel like it's Friday?! It's simple and so much fun. Grab a stack of index cards and write as many short a words on them as you have students in your class. For example, if you have 22 students, make 22 cards. Have students bring their chairs to the carpet and put them along the edge of the carpet. Hand each kid a word card and tell them to take it to their chair, sit down, and read it. Then turn on the music! They set their card with the word facing up on their chair and start walking around the inside of the circle. When the music stops, they grab the card in the chair they're in front of and have to read it before they can sit down. It will be an explosion of reading words! The beauty of this game is you can have them go around and around a bunch of times without taking chairs to get people "out" for lots of reading practice. Once you start removing a chair each time like the traditional game, it has nothing to do with reading skills.. it's just whoever gets to a chair first like normal. Make sure you have a don't-go-after-a-card-someone-else-is and we-don't-grab-out-of-others'-hands talk before you play, of course, because it's Friday and they're 6. :) It is a ton of reading practice and kids LOVE it. Once they get out, if you would rather them be doing something productive rather than watching the rest of the kids finish, have them work on their little short a books! These come in a small pack with just the short vowels or in a big bundle with all the first grade phonics sounds and blends for the year. 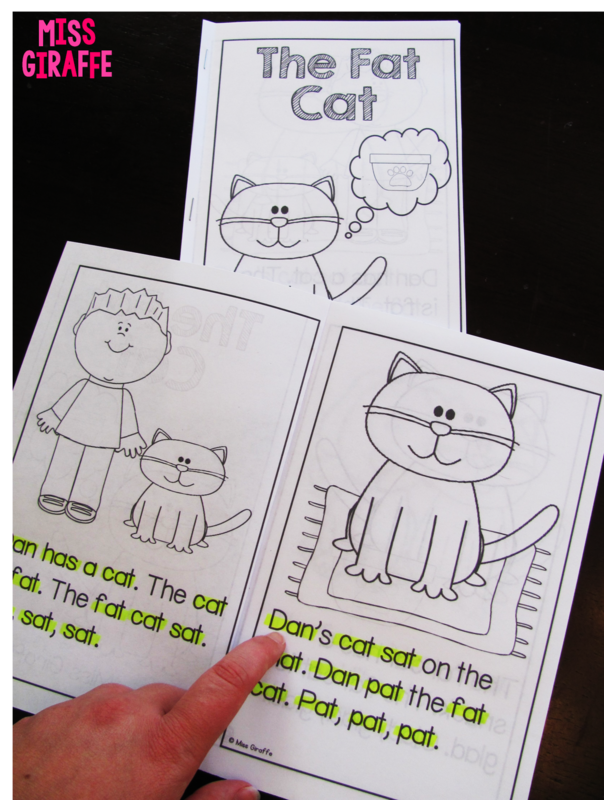 Each page has a word, a picture of the word to color, and lines to write a sentence about their picture using the word. These are another great little book to take home to their families. 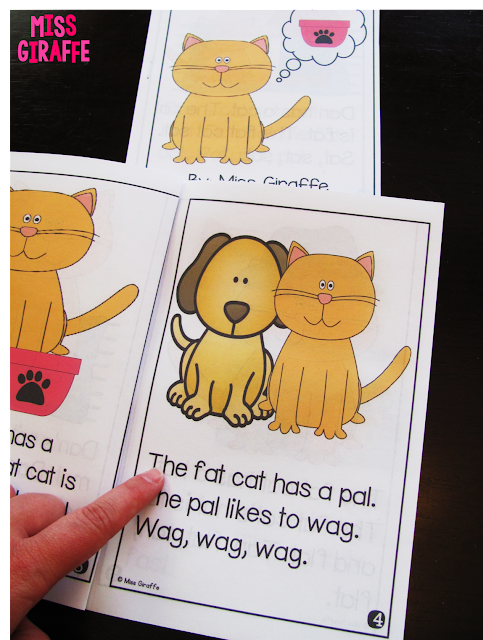 Oh, I forgot to show you the word families review books! These are another great Thursday or Friday activity once they've gotten the different word families down. There's a book for -ap, -at, and -am and a book for -an, -ad, and -ag. What they do is they color and cut out the short a pictures. Then, they sort them and glue them under the correct word family flap. They make awesome little books that are fun to read afterward. These are also great to put into interactive notebooks! I also include a pre-made version that is already sorted for you to use if you have any students that you think would struggle but you still want them to be able to do the activity. You can also use it as an example one and then throw it in the library later! Or you can just do that one with your students for an easier activity or for the sake of time. I do think the sorting challenge is the best part though so I recommend doing it that way if you can! Okay so now it's craft time!! Again, you're tired. TIRED. It's Friday... and you're a teacher. Saying you're tired is like saying pizza is delicious. Obvious. True. Understated... no matter how many explanation points you use. But the kids want fun. "FUN FRIDAY!" they proclaim. Okay, okay, let's do a craft. Bust out a No Prep Writing Craft (of which I have over a hundred writing prompts - and more coming! - in this growing pack for all different themes, topics, holidays, genres, etc.) that uses a sound like the phonics sound you're working on. You literally just hand it to them... they write on the lines, color the picture, cut it out, and glue it on a piece of construction paper and looky there, you've done a craft! They make great bulletin boards or something cute to take home to show their parents and be proud of. 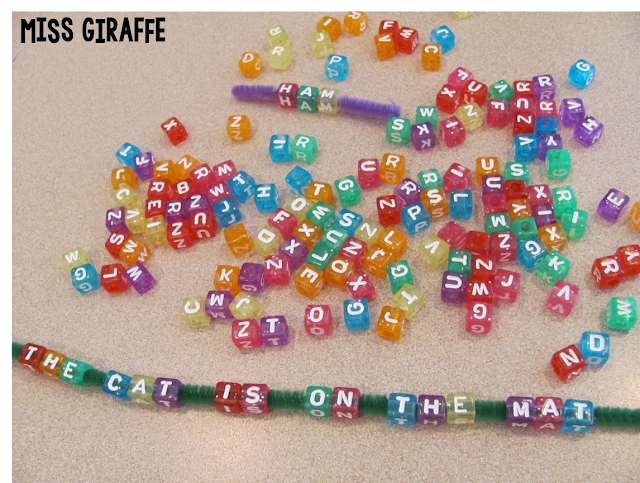 Another fun Friday center is building words with pipe cleaners and the much adored alphabet beads. You can bring out those short a pocket chart cards AGAIN (I told you there's a million ways to use them) and have them build the words on pipe cleaners. Even more fun is writing sentences using the beads! Challenge them to write little sentences using their new words and show you! .... and Phew!! I actually have a lot more I want to share but this post is already SO LONG so I'll save them! Thank you so much for reading through this if you're at this point. I really hope you were able to get some great ideas, a few free items, and maybe even some resources! Want to get a bundle of almost all of these resources?? It has all the short vowel CVC word rolls, CVC puzzles, roll and read word families sheets, short vowels reading passages, short vowel no prep packs, short vowel fluency puzzles, the little books, and more! And you'll have all those activities for all of the short vowels :) AND it's a growing bundle which means I still am adding more short vowels things to it as I create them and raising the price accordingly so the sooner you get it, the more you save.. I love growing bundles because you get things not only at a bundled discount but free stuff too as things are added! Thank you so much for your time! Happy teaching, friends! I'd love to hear from you in the comments!